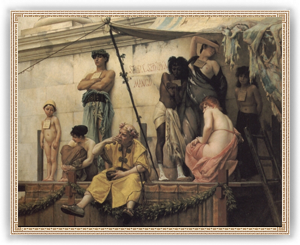 Slave Market considerably improves the trade but also affects the happiness of the common folk decreasing it noteably. It requires slave resource in province to work. Slavery is a social-economic system under which certain persons — known as slaves — are deprived of personal freedom and compelled to perform labour or services. The term includes the status or condition of those persons who are treated as the property of another person, household, company, corporation or government. This is referred to as "chattel slavery". Slaves are held against their will from the time of their capture, purchase, or birth, and are deprived of the right to leave, to refuse to work, or to receive compensation in return for their labor.